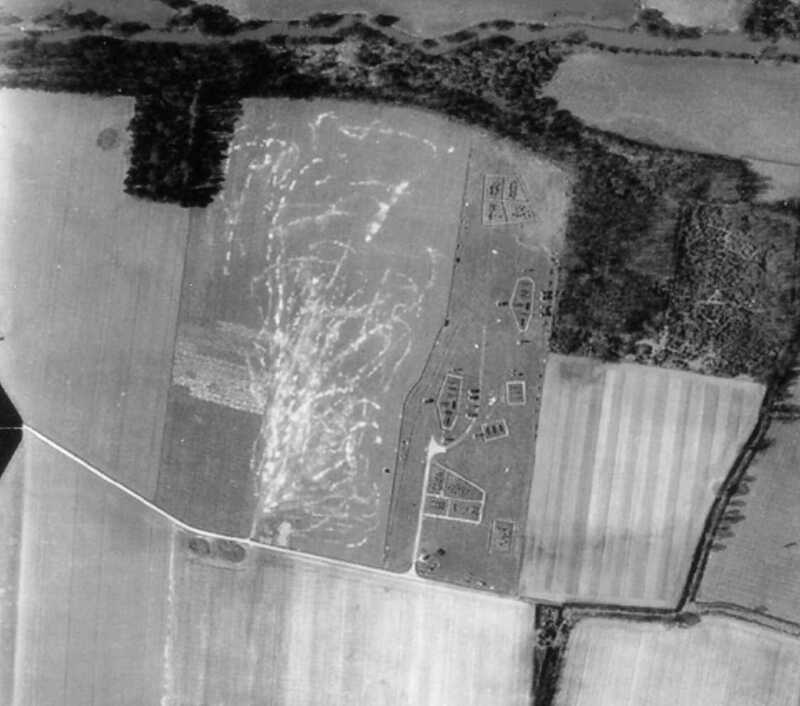 Detail of Starfish decoy site taken from a USAAF aerial photo of Carter's Hill and Winnersh, dated 8th March 1944, ref. 5045, by permission of National Monuments Record, English Heritage. Use the scroll bar to see the full width of the view. This close-up of the Starfish site shows the River Loddon at the top of the picture, with the woodland surrounding the northern edge of the field. This woodland still exists today. The main part of the field looks as if it was used for various manoeuvres, and has extensive track-marks. The eastern part has a series of set-pieces supposed to represent Reading on fire after being bombed. Each is joined by tracks, linked to the main concrete roadway. This was designed to take the weight of heavy tanker lorries which would need to deliver many tons of fuel as soon as possible after the site had been 'fired'. The main west-east track in the lower part of the picture still exists, and serves the Arborfield Hall Farm site. It is a public footpath. The cottages in the lower right hand corner were rebuilt in the 1960's and are known as 'Cockleberry Cottages'. To their south, a by-way known as Carter's Hill Lane links the cottages to Church Lane at Reading Room Cottage. To their east is another by-way called Barrett's Lane, which loops round the old Carter's Hill Farm, to meet Julke's Lane. The track heading north off Barrett's Lane has long since disappeared. It led to the Boat-house on the River Loddon used by the Simonds family of Newlands.